In May 1963, thirty-two independent African States, with genuine hopes and visions for the continent of Africa, came together in Addis Ababa, Ethiopia, to create the Organization of African Unity (OAU). I had the privilege of hearing a detailed account of the staging of the 1963 Addis Ababa Summit Conference from a man who was once described by the international media as being closest to the creation of the OAU. The man was none other than my father, the late Ketema Yifru, who was the Ethiopian Foreign Minister during the period 1961-1971. "Only a few [people] are aware of the hard work and all the effort that brought about the creation of the OAU," said my father. It is my hope that this article will give the reader a bird's eye view of the events that led to the creation of this organization. In order to strengthen the continent of Africa and to make it less vulnerable to outside influence, President Kwame Nkrumah of Ghana strongly believed that the continent should be united. Thus, in the late 1950s, he started a movement, which stressed the immediate unity of the African continent. When Dr. Nkrumah introduced the idea of African Unity, a division was created in the continent based on the implementation of this idea. On the one hand were those countries which believed in embarking on the process immediately. These countries were originally Ghana, Guinea, and Mali. Later on Egypt, the Transitional Government of Algeria, and Morocco, joined the original three to form the Casablanca Group. On the other hand, the twenty-four member Monrovia Group (which included Nigeria, Liberia, Senegal, Ivory Coast, and Cameroon) believed in a much more gradual approach to the question of African Unity. By the early 1960s, most of the independent African states had pledged an allegiance to either the Monrovia or the Casablanca Group. In January 1962, the Ethiopian Foreign Minister, Ato Ketema Yifru, received invitations from each group to attend their conference. Ketema Yifru began his tenure as Foreign Minister in 1961 by concentrating his efforts on bringing Ethiopia in line with mainstream Africa. His experience in the USA (early fifties) and, most importantly, the way in which his country was abandoned by the League of Nations during its hour of need, had made Ketema Yifru an avowed Pan-Africanist. The Foreign Minister strongly believed that his country's true allies were his fellow African brothers and sisters. For Ketema Yifru, the invitation from the two groups would ultimately bring his Pan-Africanist agenda to the forefront. In Emperor Haile Selassie's office, Ketema Yifru presented his case in a manner which drew the Emperor's attention. He reminded the Emperor of 1935, the year in which Ethiopia, a full member of the League of Nations, was abandoned by the same organization that was created to protect its members from external aggression. He advised the Emperor that a preventive measure should be taken to protect Ethiopia's future interests. Ketema Yifru explained that his country's national interest could be better served if aligned with its fellow African countries. He advised the Emperor to embrace his African identity and become a willing participant in the continent's upcoming political affairs. 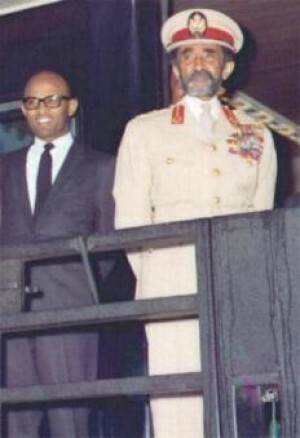 The discussion between the Emperor and his Foreign Minister led to a national conference, chaired by Emperor Haile Selassie. The question that was put forth was whether or not Ethiopia should pursue the new foreign policy that was proposed by the Foreign Minister, and thus become an active participant in the quest for a united Africa. The majority of the participants, who were conservative aristocrats, believed that it was in the best interest of the country to continue with its present course. The majority of the participants were comfortable with the limited role that their country was playing in the African political arena. However, just when the prospect of Ethiopian involvement regarding African Unity looked bleak, the Emperor gave his approval to Ketema Yifru. In fact, the Foreign Minister was given full autonomy on the issue and was only required to report on his progress. It was then time to address the inevitable question that the Ethiopian government was facing - whether to attend the Monrovia or the Casablanca Conference. Foreign Minister Ketema Yifru had to make the choice and present his decision to the Emperor. The Foreign Minister decided that it would be in the best interest of his country and the cause for unity to accept the invitation from the Monrovia Group. The logic behind his thinking was that the Monrovia Group outnumbered the Casablanca Group twenty-two to six. If Ethiopia had aligned itself with the Casablanca Group, it would only help in widening the ever-growing rift between the two groups. In short, Ketema Yifru's decision was based on a pragmatic approach rather than an ideological stand. At the Monrovia Group conference in Lagos, Emperor Haile Selassie launched Ethiopia's peacemaking effort in his speech to the conference by stating that the gulf between the Monrovia and the Casablanca Groups was not as wide as it seemed. At a time when others had publicly declared their alliance to one of the two groups, the Ethiopian government was openly declaring its neutrality. Meanwhile, the Ethiopian Foreign Minister began to lobby the conference participants to have the next meeting in the Ethiopian capital of Addis Ababa. Ketema Yifru, who was working to bring the two groups together, believed that once he had the approval of the Monrovia powers, he would work on having the Casablanca members attend the proposed Addis Ababa Summit Conference. Through his relentless efforts, all of the Monrovia Summit participants accepted Ketema Yifru's proposal to have the next meeting in Addis Ababa. In the meantime, the Casablanca group had scheduled a conference in Egypt for June, 1962. Foreign Minister Ketema Yifru, who was at work to bridge the gap between the two groups, formulated a plan. Since he had very good relations with the Guinean government, including President Sekou Toure who was one of the leaders of the Casablanca group, he believed the governments of Ethiopia and Guinea could form a partnership to bring the two opposing groups together. The Foreign Minster approached the Emperor with his plan to extend an invitation to President Sekou Ture for a state visit to Ethiopia. The Emperor agreed, and a special invitation was sent to President Toure who was then attending the Casablanca Group conference in Cairo, Egypt. The Guinean President accepted the invitation and met with the Emperor and his Foreign Minister on June 28, 1962. At their meeting, Foreign Minister Ketema Yifru, who had forged a close friendship with President Sekou Toure and other members of his government, presented his case to the Guinean delegation. He pointed out that the conflicting views of the Monrovia and the Casablanca Groups could create a permanent division in the continent and advised the Guinean delegation that it was in the best interest of both governments to stop such a drastic occurrence from taking place. To the Foreign Minister's delight, after some convincing, the Guinean delegation agreed to help in bringing the two groups together. President Sekou Toure would later reaffirm his government's position during his talks with Emperor Haile Selassie. The dye had been cast. It was agreed by both governments that the May 1963 Addis Ababa Summit Conference, which was initially set for the Monrovia Group, would be a Summit Conference of all the independent African States. Following the agreement, the two heads of state issued a communiqué that stated that both governments believed the gap between the two blocs was dramatically increasing. Therefore, in order to protect the continent from falling into harm's way, the governments of Ethiopia and Guinea had decided to call an all African Summit Conference in Addis Ababa, in hopes of resolving the differences that existed between the Casablanca and the Monrovia Groups. After the communiqué was issued, the next step was to convince both the Monrovia and the Casablanca blocs to attend the proposed Summit Conference in Addis Ababa. It was decided that the Ethiopian government, represented by Ketema Yifru, would lobby both groups, while the Guinean government, represented by Mr. Diallo Telli who became the first Secretary General of the OAU, would lobby the Casablanca Group members. Foreign Minster Ketema Yifru embarked on a long journey across Africa with the Emperor's letter of invitation. Determined to ensure the success of the planned summit, he made sure that he received a positive answer from each Head of State before leaving each country. One of the tactics he used to encourage the leaders to accept the letter of invitation was to make it appear as if he would not be permitted to enter Ethiopia if the leaders did not accept the invitation to the Conference. All in all, the thirty-two independent African States accepted the invitation for May 1963. The leaders agreed that the summit would begin with a Foreign Ministers Conference to iron out various issues, including the drafting of a charter. The Conference of Foreign Ministers of the African States opened on May 15, 1963 with Ketema Yifru elected as chairman. The task of the African Ministers was to create a charter which could become the cornerstone of a future organization. Some of the governments that were represented in Addis Ababa had different views on the components of the charter. Ethiopia, Ghana, and Nigeria had each drawn up charters, which they wanted to become the basis for discussion. While the charter of Ghana represented the views of the Casablanca group and the Nigerian charter represented the position of the Monrovia bloc, the Ethiopian draft charter embodied the views of both groups. As a result, the Ethiopian draft charter was chosen to become the basis for discussion. Before a consensus could be reached on adapting the charter, the Heads of States Conference was convened on May 22, 1963. Emphasizing the need to sign a charter and create an organization, Emperor Haile Selassie noted in his speech, “This Conference cannot close without adopting a single charter. We cannot leave here without having created a single African organization [with] the attributes we have described. If we fail in this, we will have shirked our responsibility to Africa and to the people we lead. If we succeed, then, and only then, will we have justified our presence here.” With directives from the Heads of State, the Foreign Ministers conference was convened once again to create a charter that could be signed by the Heads of sSate before the Summit was adjourned. The African Ministers worked overnight to come up with a charter that could be signed by their leaders. After some deliberations, thirty-two Heads of State - Algeria, Benin, Burundi, Burkina Faso (formerly known as Upper Volta), Cameroon, Central African Republic, Chad, Congo-Brazzaville, Congo-Leopoldville, Egypt, Ethiopia, Gabon, Ghana, Guinea, Ivory Coast, Liberia, Libya, Madagascar, Mali, Mauritania, Morocco, Nigeria, Niger, Rwanda, Senegal, Sierra Leone, Somalia, Sudan, Tanzania, Togo, Tunisia, and Uganda - signed the OAU charter in Addis Ababa, on May 25, 1963. The creation of the Organization of African Unity was indeed a significant historic moment for the continent of Africa, especially in an era where a number of African countries were still under colonial rule. Once the OAU was set up, Africans were able to come together under the umbrella of their newly formed organization. Through the OAU's liberation committee and the United Nations, Africans were able to work collectively to bring about an end to colonialism. The plight of the African people that was once dismissed by many was now heard by the entire world. In the early years of its creation, the OAU was able to conduct its own successful brand of conflict resolution. The Ethio-Somalia, Kenya-Somalia, and the Algeria-Morocco conflicts are examples of the OAU's ability to halt potential wars by peaceful means. At that time, it seemed that Africans had come to a point where they had mastered the art of solving their own problems with their own brand of solutions. The Pan-Africanist atmosphere of the 1960s had brought with it an understanding that any conflict in Africa, regardless of its geographical location, was an African problem. It was with this positive outlook that our leaders were able to successfully solve many conflicts. This article is drawn from materials presented at www.oau-creation.com. Thank you for a very beautiful and informative presentation. It was the best years of Africa and Ato Ketema Yifru is a credit to his people. It is important that we unite for that is the only way for a better tomorrow. that follwed led to the birth of a dysfunctional OAU with various heads of state jockying for personal and narrow interests.Nkrumah and Padmores vision was blighted with various assassinations, wars and outmaneouvering by intelligengence agencies of the west.I hope you will help us learn more by going into detail on the various disagreements and compromises reached. I AM HAPPY TO RECIEVE THE HISTORY OF THE SOVREIGN STATE OF AFRICA. A friend of mine is presently writing a project on the formation of OAU. This information is really useful and has contributed greatly. I am very proud with the Governments who stood for Unity and established OAU. My Problem is our people are more destitute and more helpless and nothing seems to be resolved. Why we, the modern African have problem of working together and solve our problem? You never give up you should never stop trying. President Obama's wining the presidency proofs to us that, if you want to make it happen, if you are passionate enough and sincere it might take time but you can achieve your goal. For all Africans it is in our best interest to work together if we want to change Africa. Please go to www.lifessecondchance.org. I am privileged to be friends with the children of H.E. Ketema Yifru who is very instrumental and an icon in the formation of OAU. He left a good name behind for his kids and Ethiopians at large. I just hope that the leaders of our time look back and remind themselves why the OAU was formed. get the history of the formation of the OAU. A nicely summarised review of the chronicles of the formation of the OAU. As a young college graduate preparing for a tour of duty to a rural health center, I was in Addis when the heads of States flew in to Addis for that historic summit. I cannot express the emotions that many of us then felt to see Africa who to the most was in a grip of colonization only a few years ago uniting to lead its people into unity and development. I have read also the immense contributions Foreign Minister Ketema Yifru had in the formation of the OAU but the details in this piece would no doubt prove his true statemanship. The present charge for the heads of states in the present day Africa is maintaining that unity and striving hard for it to reflect on our modern day enemies- diseases, hunger and poverty.